Cute and Cuddly – or in Danger? It is an unfortunate fact that far too many cat owners do not understand that their overweight and obese cats are in serious danger of developing major health problems. Obesity is the most common of all nutritional disorders in cats, and is reaching epidemic proportions in the UK – with the PDSA warning that some 50 per cent of our feline companions are now too fat, and a YouGov study finding that 91 percent of the nation’s cats are actually at risk from health problems caused by obesity. So what are the dangers to my cat’s health? Numerous studies have shown obesity to have major detrimental effects on a cat’s health – ultimately reducing both the length and quality of its life. Obesity-associated insulin resistance is the most common cause of Diabetes in cats, and surveys have shown that as many as 200 cats in every 10,000 develop this disease. Heart Disease and Arthritis are seen more commonly as the number of overweight cats increases. Many cats have been inflicted with arthritis by the time they reach the age of 12, and if they are carrying extra weight this painful condition worsens considerably; resulting in a considerable reluctance to exercise – and hence yet further weight gain. Obese cats are also at increased risk of developing urinary system disorders, some cancers, hypertension, liver disease, orthopaedic and many other disorders. As cat owners we must face up to the fact that we are large to blame for our overweight feline friends – and therefore the health risks which this inflicts upon them. * Treats: Food in the form of ‘treats’ is used by many owners to interact with their cats, and to demonstrate their love for them. Cats are intelligent creatures, and quickly learn that rubbing our ankles, or a plaintive cry will frequently result in a treat being bestowed upon them. No matter how correct their meal time diet is, these additional treats will always be the first steps towards an overweight cat. * Feeding ‘Style’: The manner of feeding plays a major role in the cause of obesity. Cats fed on an “as you please” basis, with food left out and available to them all the time, will eat whenever and as often as they want to; and many studies suggest that this style of feeding may be the biggest factor leading to obesity. * Diet: Fats are more palatable to a cat than carbohydrates and proteins, but appear not to satisfy hunger. When dietary fat is overfed the excess is deposited in various parts of the cat’s body and becomes fatty tissue. It appears that nature did not intend our cats to be carbohydrate eaters. Unlike most mammals, they do not have carbohydrate-digesting enzymes in their saliva to begin the digestion of carbohydrates in the mouth. Therefore, in most cats, the carbohydrates are converted into fat rather than being burned off for energy. Cats need more protein than dogs, but if it is receiving the right amount and quality of food then it should not suffer from a protein deficient diet. Overweight cats will consume more calories than they actually need. * Sedentary Lifestyle: Lack of exercise is an obvious cause of obesity. In addition to burning off the calories, exercise is fun for cats. Although they spend a lot of time curled up on the sofa they do like to chase things, explore, hide from imaginary predators, and generally run around. Leaves blowing around the garden can keep an outdoor cat amused for hours, as can exploring underneath shrubs and hedges – especially if they have another cat to play with. Indoor cats, particularly those left alone for long periods of time, will simply sleep the day away unless they have plenty of interactive (and ever-changing) toys to play with – and they need owners who will dedicate time to playing games with them on a regular basis. Many owners with more than one indoor cat will be all too accustomed to the sound of their cats thundering around the house as they chase and hide from each other – exercising in the best possible way. * Drugs and Ailments: The use of certain drugs has been reported to cause weight gain, and there are also some ailments (such as a thyroid imbalance) which do the same. * Breed, Genetics and Age: Certain breeds are known to be at higher risk of being overweight, and genetics and age can also play a role in this difficult health problem for our loveable felines. So is your cat overweight? You should be able to feel the ribs without pressing and without feeling excessive fat between the skin and the ribs. Looking at your cat from above you should be able to see a noticeable waistline – rather than a bulge. From the side, the abdomen should go up from the tummy to the inside of the thighs. There are a number of Body Condition Score Charts available, and we have used one here which we think is one of the easiest to understand. Most spayed and neutered cats develop what looks like an empty pouch hanging below their belly. It is similar to a loose bag or flap of skin. Frequently called a “spay sway” because it sways from side to side when they run, it is also known as an “abdominal fold” or “belly flap”. It is suggested that the pouch is due to heredity, and has existed since earlier times. It is certainly seen in wild cats – the ancestors of our domesticated felines. 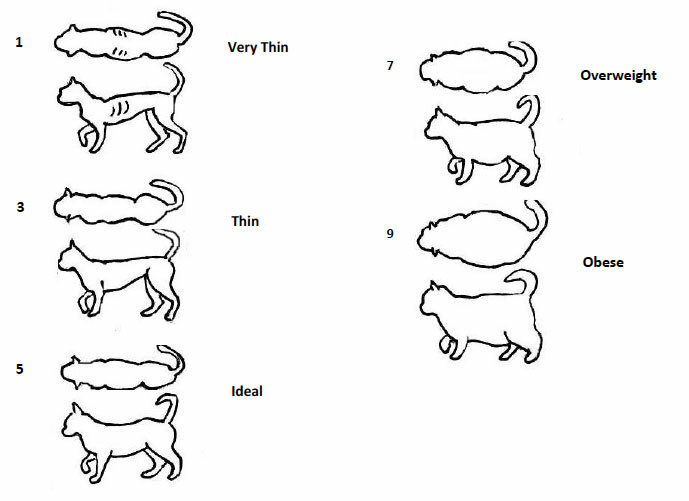 If your cat has been spayed or neutered and has such a pouch, then assess his/her weight by looking at him/her from above when he/she is standing; and ensure that you can see a definite shape at the waist (as in number 5 above). The ribs should be easy to feel. 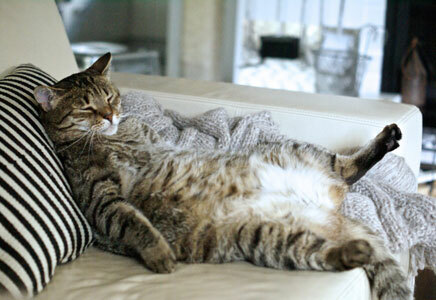 If your cat is overweight it is vitally important that you do not put him/her on a crash diet. Cats must lose weight gradually and in a controlled manner. Sudden loss of weight can result in life-threatening liver disease. An overweight/obese cat must be seen by a vet; firstly to ensure that there are no underlying disease problems present. Then, only if the cat is otherwise in good health, can the vet then recommend the best approach to enable your particular cat’s new feeding regime (diet) to facilitate a controlled loss of the surplus weight. We cannot over-stress the importance of veterinary advice as the very first step towards bringing your cuddly feline companion back towards a healthier weight, and hence a better life. You can help this by cutting out the treats and titbits. It will be difficult to ignore the plaintive mewing which your cat knows will usually result in a tasty treat….but you must! He or she will soon learn that you’re not such a soft touch. You now know how dangerous these treats are (unless they are taken from the new daily food allocation), so stay your hand – and don’t forget the playtime exercise!! Edited By Fred Reyers BVSc (Hons), MMedVet(CLD) Principal Lecturer, University of Lincoln. 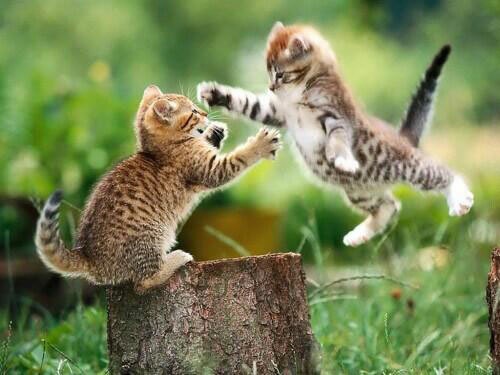 "There is no need to teach cats how to have fun, since they are blessed with an inherent talent in this art"